A measure of anticipated swings for the pound climbed to the highest in three months before U.K. Prime Minister Theresa May’s speech on Brexit plans Tuesday and a court ruling this month on whether the British leader or Parliament carries the power to invoke the exit. The pound slid below $1.20 for the first time since October’s flash crash after the Sunday Times reported May will prepare to withdraw from tariff-free trade with the European Union in return for freedom to curb immigration and strike commercial deals with other countries. While hedge funds started to boost bets against sterling from the end of last year, Bank of Tokyo-Mitsubishi UFJ Ltd. said the Supreme Court ruling may spur investors to unwind these short positions. 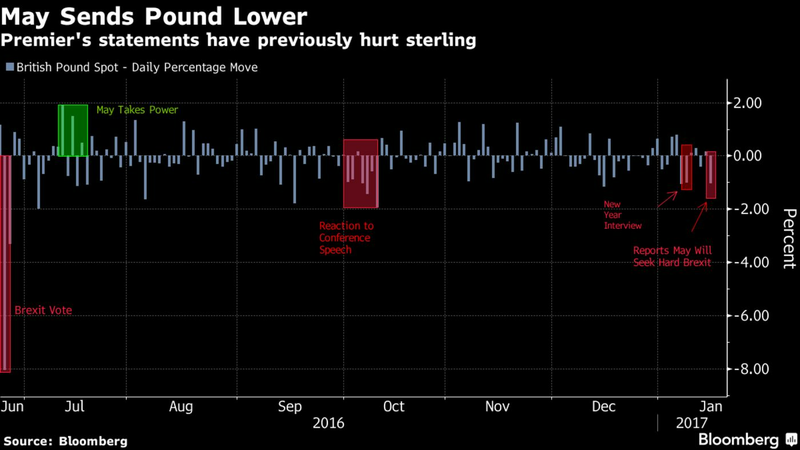 The pound fell as much as 1.6 percent on Monday to $1.1986, the weakest level since Oct. 7 when it slid to $1.1841, the least since 1985. Sterling was 1 percent down at $1.2065 as of 11:14 a.m. in London. Government officials said they expected May’s speech to cause a further “market correction,” according to the Sunday Times, which didn’t say how it obtained the information. The prime minister’s office declined to comment on the report when contacted by Bloomberg. Sterling pared its losses in London trading as the U.K. Treasury was said to be drawing up plans to reassure investors following May’s speech on Tuesday and U.S. President-elect Donald Trump told the Times he will offer the U.K. a “fair” trade deal. One-month implied volatility for the pound climbed to as high as 13.3325 percent, the most since Oct. 12, from 12.0250 percent Friday, as traders sought protection against more turmoil. Bank of England Governor Mark Carney will speak at 6:30 p.m. in London Monday before the release of December inflation data on Tuesday. The pound may come under broad‑based downside pressure this week as faster inflation is expected to push U.K. real interest rates further below zero, according to Commonwealth Bank of Australia. Leveraged funds boosted net short positions on sterling to 61,273 contracts as of Jan. 10, double the amount from the week ending Dec. 20, according to data from U.S. Commodity Futures Trading Commission. May’s speech isn’t the only approaching Brexit milestone. 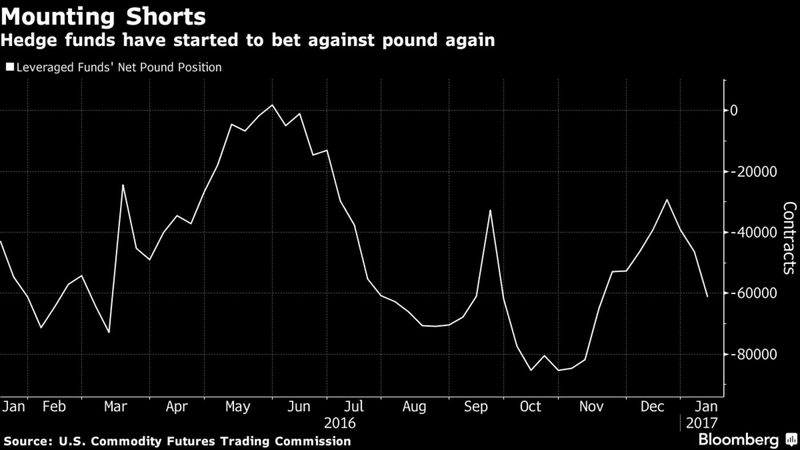 “The pound risks a violent rally to cover short positions if the U.K. Supreme Court rules to support Parliament,” said Naohiro Nomoto, manager of foreign-exchange trading at Bank of Tokyo-Mitsubishi UFJ in Tokyo. The pound is prone to outsized swings during Asian trading, with the most extreme being October’s flash crash when the currency tumbled over 6 percent within minutes. While an investigation by the Bank for International Settlements released last week found no single cause for the event, it highlighted that the time of day played a significant role in making the market more vulnerable.